Traditional Latvian Cuisine: What's In The Menu? Let’s cut straight to the point: many people don’t know about Latvia. But even less people know anything about Latvian food. You’d be surprised – there’s a lot of people even here, in Latvia, who don’t have a slightest idea about the most traditional and the most popular dishes of the Latvian cuisine. Why? Maybe it’s because Latvia is home to many other nationalities other than just Latvians: there are thousands of Russians (like me), Belarusians, Ukrainians, Poles, Lithuanians, Jews, etc, that altogether make up no less than 40% of the Latvian population. But just because you’re of a different ethnicity and you like to keep your traditions alive, doesn’t mean that the traditions of the country you live in have to be ignored. But I deviate, sorry for that. Let’s talk about traditional Latvian cuisine instead, shall we? So what is the staple food of traditional Latvian cuisine? To answer that question you have to remember that Latvians used to be serfs up until the early 1800’s, so typical Latvian food will always be high in calories, heavy, a bit fatty, and low in spices, which were very expensive to import back in those days. Latvia is a relatively young country, but the century-long history of its territory is marked with German, Swedish, and Russian invasions, so, naturally, traditional Latvian cuisine has a lot of foreign elements. Germans eat sauerkraut – Latvians eat sauerkraut. Swedes eat yellow pea soup – Latvians eat that too. Russians love rye bread – and Latvians can’t imagine their cuisine without it. But despite all the similarities, typical Latvian food has its own individual motifs and is still pretty much “Latvian” – even in comparison to Lithuania and Estonia, the countries that look like siblings at first sight. As an example, Latvians eat a lot of beans that are very high in protein and are a perfect substitute for meat, which wasn’t affordable for many people back then. One of the most traditional dishes is grey peas with bacon, which was (and still is) usually served at Christmas. People believed that eating peas brought luck and money, so they ate A LOT of it, accompanied with pork in aspic, herring in a jacket, caraway cheese with rye bread, pearl barley with hazelnuts…. So in other words, to eat like a Latvian is to eat in abundance. You eat until your stomach starts hurting. And when that happens, you fight fire with fire by eating even more food: this time, it’s soups. Sorrel soup, sour cream soup, sauerkraut soup, and even milk soup are the best medicine against stomach aches, as they help digestion, which was a huge problem for people living in the Middle Ages because of how heavy food was back in those days. What does a typical Latvian menu look like? Bacon Rolls (Pirāgi): Best straight from the oven, pirāgi is half-moon shaped rolls stuffed with bacon, onions and eggs, and served with a cup of chicken broth. Piragi is, neither more nor less, the foundation of traditional Latvian food. Vegetable Tarts (Sklandrauši): These delicious round tarts come with two types of filling: carrots or potatoes. The idea is to give the tarts orange color, make them look like Sun, and serve on the Easter table. But of course, sklandrauši are so good that people don’t wait until Easter comes and instead give themselves this little treat throughout the whole year. Which is totally understandable. Cold Beet Soup (Aukstā zupa): This is the type of a soup that is typical for every Eastern European cuisine. It’s absolutely mouth watering! Meatball Soup (Frikadeļu zupa): Another absolute delishiousness in the form of a soup! 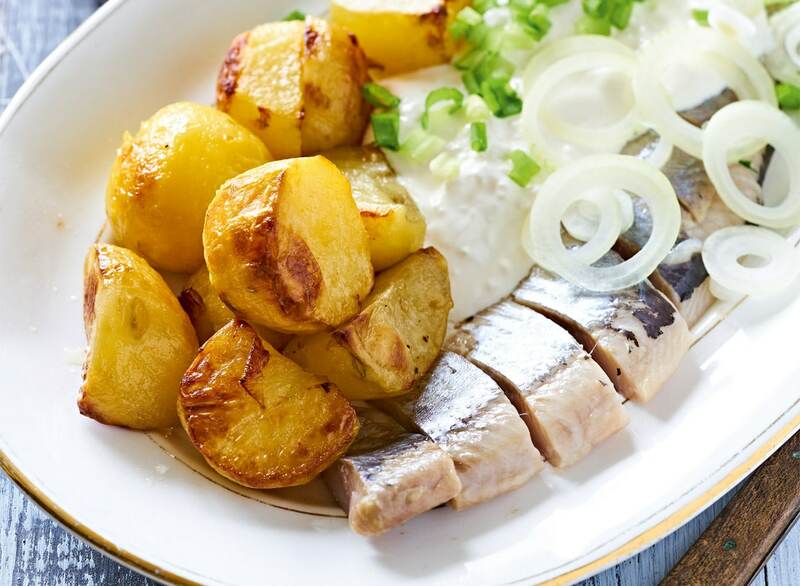 Herring with Cottage Cheese and Potatoes (Kartupeļi ar siļķi un biezpienu): Three most typical Latvian foods combined in one, which makes this dish the ultimate formula of Latvian cuisine. Groats Porridge (Bukstiņbiezputra): Grain porridge with potatoes and streaky bacon with cream… yummy! Sometimes Bukstiņbiezputra is served as a hot started in restaurants, but people eat it for lunch as well. Potato Pancakes (Kartupeļu pankūkas): Crispy! Salty! With sour cream and berry jam! No one can refuse kartupeļu pankūkas! Cranberry Pudding (Debessmanna): A sweet farina porridge with cranberries that is lighter than air and that melts in the mouth within one instant. 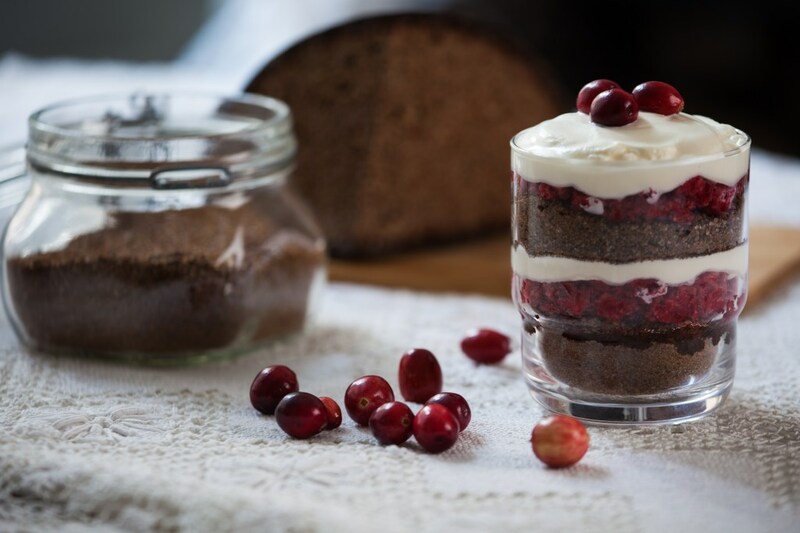 Layered Rye Bread Dessert (Rupjmaizes Kārtojums): This is an exclusively Latvian delicacy: airy, layered substance made of rye breadcrumbs, whipped cream, and cranberry jam. Sounds simple but this dessert is so good that its second name is Latvian Ambrosia. Because even pagan gods in Livonia used to love it! Latvian Beer: Valmiermuižas, Brālis and Brenguļu are the best brands in Latvia, where the brewing traditions date back to prehistory. If you’re looking for something a bit cheaper, Užavas beer will be a great alternative. The most popular brands, at the same time, are called Aldaris and Cesu Alus, but they’re really not that great, to be honest. Riga Black Balsam: Traditional herbal liquor with an incredible amount of different ingredients mixed in pure vodka, not everyone is able to handle it. Riga Black Balsam comes in several tastes, and is usually added to tea or coffee, or even made into a cocktail. Kvass: This is when Latvian love to bread finds its ultimate end: kvass, as you’ve guessed, is a rye bread drink with a small amount of alcohol in it (1.2%). Traditional Latvian cuisine has kept its original medieval taste, which is far from being “plain” and “boring”, as many people might think. In fact, there’s way more variety in Latvian food than, let’s say, in Germany, which, as influential as it was, isn’t that much into fish, for example. It is only in North Germany where people traditionally eat Fischbrötchen, whilst in Latvia fish is the queen of the everyday table. I therefore dare to claim that Latvian cuisine is one of the best in Eastern Europe, as its main characteristics – variety and abundance – are accentuated more than anywhere else! In Latvia, you eat well, you eat plenty. And is there anything more one needs to be happy? 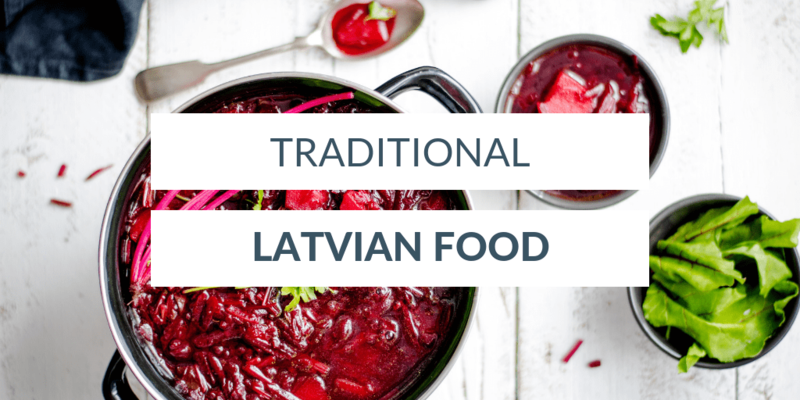 Have you tried any dish from traditional Latvian cuisine? I don’t think I’ve ever tried any of these dishes before, but they all sound really good. Thanks for sharing! Love Eastern European food so looking forward to sampling more when we make it over to Latvia. That soup looks an amazing colour and lots of veggie options too which is great. That’s my favourite soup, actually! We usually eat it at summer because it’s cold, but I eat it during winter too. I love it! omg those pictures! I am so hungry now haha! It’s kinda similar, but soooo different from borscht still! Cold beet soup is also part of the Russian cuisine, by the way! Look very different from what I am used to (Asian food)! But, hey I am willing to try! Reading through this post I can definitely see the similarities between the cuisine of my Polish and Ukrainian counterparts! Eastern European cuisine as you say is rich and fatty and good! Although I do tend to stay away from borsche (beet soup) and herring. Maybe I should give it another try? My Baba would be very happy! I love beets! Russians (and I think Latvians, too) also have beet salad, it’s amaaaazing! Wow i had no idea what type of food you would find there. I think the bacon tarts and the potato pancakes would lure me in most! That was the best part of my trip to the old country!!! Food,beer,dessert, beer,food,beer,pastry,beer,etc. Latvians always have piragi (bacon rolls) handy in case someone stops by. Another popular beer food is rye bread bits toasted in butter (or deep fried)with chopped garlic. All bars serve as appetizers. That cranberry pudding looks spectacular! I should try that! Thanks!! Mmmmmm! Give me any of those desserts any day! Great Post! These food photos are beautiful! Love the look of that beet soup :) Never tried one of those before! Your post just made me hungry!! Everything looks delicious. When I was living in Oslo my Latvian friend made a Latvian dinner based on a potato dish. It was SO good. He always joked that in Latvia all they eat is potatoes because they’re cheap xD When we went to Latvia the food was such good quality and affordable! Eastern European cuisine is one of my favorites (pancakes!!!). Great article. All these brought memories back form my childhood! All are delicious and don’t forget biezpiena plācenīši, shuba (borrowed that one from the Russians) and honey cake (medusa kūka)! Oh, I love shuba and honey cakes! Those were my favourite when I was a kid! Ok, but who said that rye bread comes from Russia??? Latvians have eaten rye from the beginning of the world! It is in our DNA, rye is sacred to Latvian! You had me at “bacon roll”. Wonderful descriptions and photos. So hungry now! Because food (when it’s good) has to be celebrated in abundance!! But where is štovēti kāposti (stewed sauerkraut cabbage) and mazsālīta cepta siļķe ar kefīru un kartupeļiem(fried salted herring and potatoes with kefir) and Užavas beer and skābputra utt. It’s really unfair that these dishes were missed out, that’s true!!! I’ll update the blog post later on, thanks for your input, Sanita! “Tervetes and Bruveris are the best brands in Latvia” << That's just not true. Tervetes is not so good, and Bruveris is made by Aldaris, which is the worst brewing company in Latvia. The best beer brands in Latvia are Valmiermuižas, Brālis and Brenguļu. Make sure you try the unfiltered versions of each, those are the best. If you want something cheaper you can try Tervetes, Bauskas or Užavas. Thanks, Aleksejs, I’m gonna include this in the blog post now! All food is very yammy, but I do not see rye bred soup with whipped cream(maizes zupa ar putukrējumu).